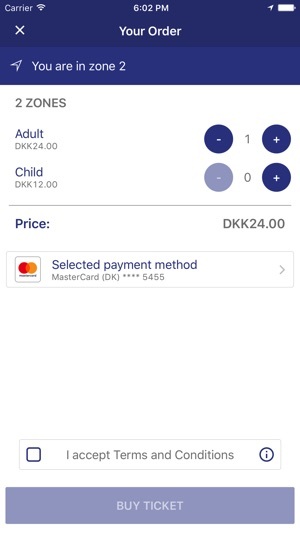 With the DOT Mobilbilletter app, you can easily buy mobile tickets for short journeys (up to 8 zones) on Zealand, Lolland, Falster and Møn. DOT Mobilbilletter is developed by Din Offentlige Transport (DOT) and is owned by DSB. 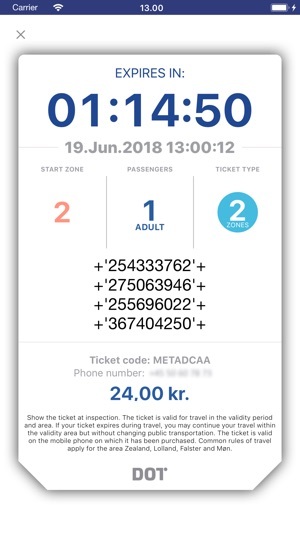 The tickets are valid for journeys by bus, S-train, Metro, DSB Long-distance and Regional trains, Lokalbaner, Regionstog and Øresundstog in Zealand, Lolland, Falster and Møn. You pay with your payment card or the Prepaid Zone Card if you have the required number of credits on your Prepaid Zone Card for the selected journey. However, the Prepaid Zone Card can only be used to pay for 2-8 zones tickets. Please note that the 19th January 2019 is the last day you can purchase Prepaid Zone Cards. Prepaid Zone Cards purchased from the 20th July 2018 to the 19th January 2019 are valid until the 19th July 2019. You can save your payment card details and access them via a code chosen by you. That way, you do not have to enter all card details every time you make a purchase. The payment card details are stored with DIBS. 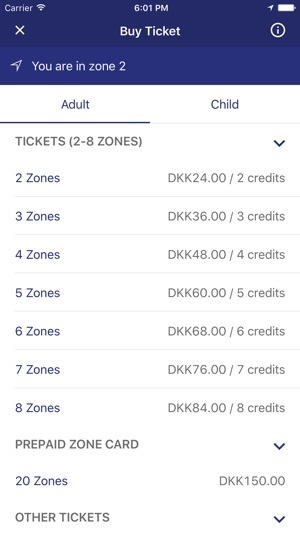 DOT Mobilbilletter can sell tickets from your location and for the number of zones you want. To allow DOT Mobilbilletter to find your position, you have to enable the GPS of your device. The app will automatically find the zone you are in. If you are close to a zone boundary, you will have all the zones near you. • You can buy extension tickets for 1 zone. The additional zone extends the zones on your ticket or commuter card by 1 zone. 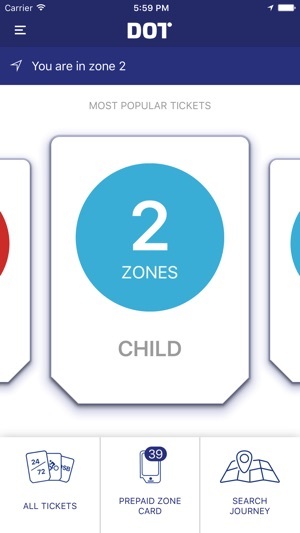 • Extension tickets for 2 zones or more should be purchased as a normal ticket for the number of zones required. You do not have to be in the zones for which the extension ticket is to be valid when you buy it. • Extension tickets must be presented together with a valid commuter card or ticket. Remember to buy your mobile ticket before you start your journey. The ticket is only valid on the phone and the phone number on which it was purchased. Use of third-party keyboards (e.g. Swiftkey and Fleksy) will cause the app to crash when the user enters the registration code. It may also cause problems when the user enters payment card numbers. My gps is working fine and it even has a dot at my location in the app, but it says it cant determine my location so I can't buy tickets. First - fix the app! Secondly - why can't I just manually enter my location. The lack of userfriendliness and this issue make it clear they aren't putting much effort into the app! There's no need to select the card type when entering payment information; it is filled automatically after the card number is entered.